Whereas the Surrealists process would involve an artist drawing on a portion of a sheet of paper before folding it over to hand to the next artist who would make their contribution prior to folding it again for the next artist to finish the work that would become a mysterious or comical mélange of incongruous images, Samantha & Andre allowed their works to be two or even three dimensional and shift based on visual interpretation while not be confined to "folded incomprehension". After observing what each had done, the only rule that they imposed on the continuing process (besides not ever discussing anything that they were thinking or doing) was that the other artist had to make their new work within one week. 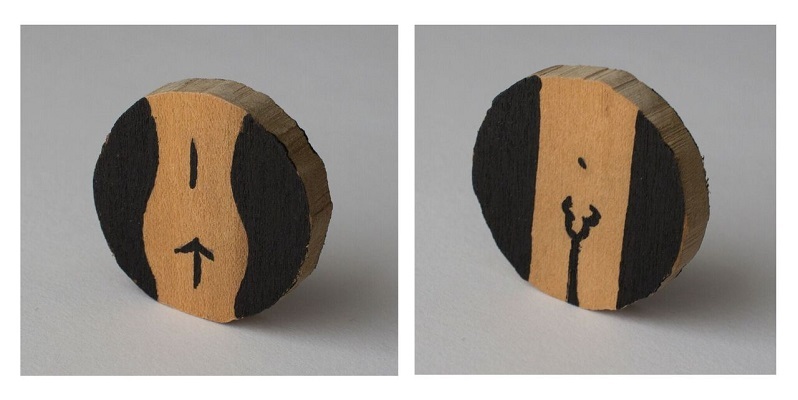 Those new works will be continuing to be posted here as they unfold each week. AN "EXQUISITE CORPSE" LIFE (RATHER THAN THE TYPICAL 2D SURREALIST FORMAT OF DRAWING ON FOLDED PAPER). THE OTHER WOULD RESPOND WITH THEIR WORK WITHIN ONE WEEK. RETURN REGULARLY TO SEE THOSE "CALL & RESPOND" WORKS UNFURL. When I received Samantha’s Newsletter, we were on our way to Washington DC for the now historic Women’s March on Washington. There was a bit of a lull with the call and response since most of our time was spent creating protest posters and having protest poster parties. The day after the March on Washington, Samantha and I went to see Bill Viola’s exhibition, The Moving Portrait, at the Smithsonian’s National Portrait Gallery. I was particularly struck by the video installation ‘The Raft’, which depicts a group of 19 people in modern clothes being hit by a violent jet of water. The video installation referenced Théodore Géricault’s Le Radeau de la Méduse (The Raft of the Medusa) and made me reconnect to Samantha’s Newsletter. I began to think of my response in the framework of these two pieces created by two artists whose work I admired very much. Doing quick research on Géricault’s work, I began to tie the story of the Medusa and it’s captain and passengers to an email campaign to Samantha. The email campaign (which kept getting sent to my Junk mail during my MailChimp tests) advertised a tour of the Potomac River on the vessel La Méduse, whose image actually depicts the notorious British passenger liner, Titanic. The captain is shown as Steve Bannon whose face is imposed over the body of Italian captain Francesco Schettino. In 2015 Schettino had been found guilty of manslaughter when his ship hit rocks and sank in 2012, killing 32 people. Underneath the image a caption reads “Your Captain: Hugues Duroy de Chaumareys!”, Chaumareys being the captain of Méduse, the French frigate that sank off the coast of West Africa, leaving survivors adrift for 15 days on the raft depicted by Géricault. The email goes on to detail the wonderful adventures that await you on La Méduse, and a quote from David Foster Wallace from his book “A Supposedly Fun Thing I'll Never Do Again: Essays and Arguments” about his time on a cruise ship. The quote from this particular author was intentional since David Foster Wallace is one of Samantha’s favorite authors. Finally, a call to action to “View all Cruise Packages!” sends the user to www.whitehouse.gov. This is my second analog project for Mr. & Mrs. Exquisite Corpse. 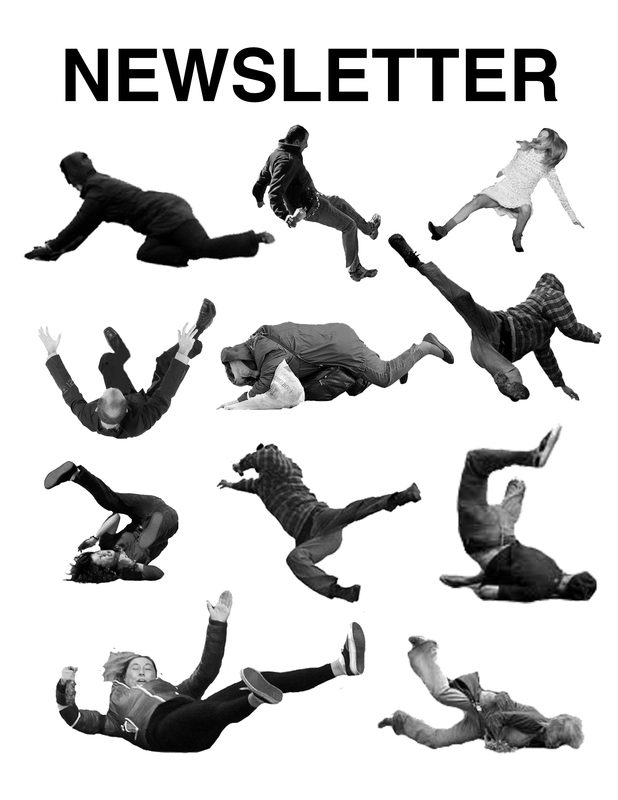 I created “NEWSLETTER” in Photoshop using images of people falling down, culled from a Google image search. 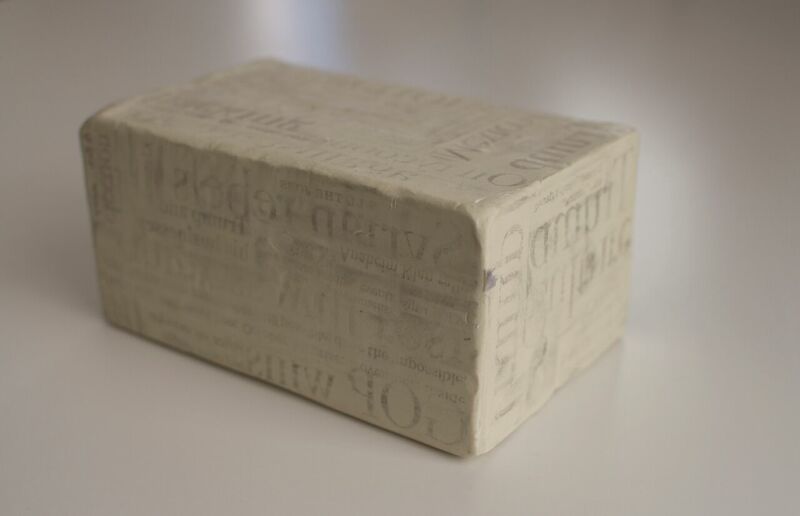 Andres “Fake News” presented words culled from the media, transferred onto an malleable block of plasticine. When the news becomes unreliable, what’s left? 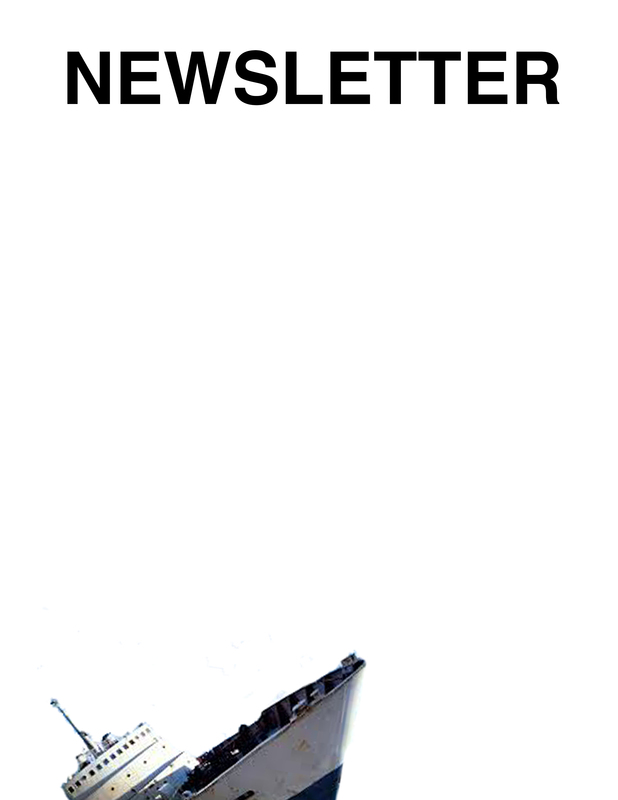 In response, I wanted to make a NEWSLETTER that was the opposite of branded, corporate news, so I went into my way-back machine to visit two eras: The Dadaist movement, and the late 1980s. Of course, we all know the Dadaists were all about the absurdity and meaninglessness (where ironically, meaning often lies) born from the chaos of WWI. But the late 1980s…..those were the years where family newsletters, mailed during the holiday season, were at their peak. Letters would carefully detail family successes, recapping another great year! Early ones were handwritten and mimeographed. Later, PCs and the miracle of easy word processing would make them slicker, but always with bad typographic choices. My NEWSLETTER marries the absurdity of Dada with the late 80’s family newsletter with a nod to 1980s’ generic grocery product labeling. (see LUNCHEON LOAF image) NEWSLETTER will be mailed to my mailing list, and to several random whitepages addresses. Seeing the list of keywords, I had (on my own) began thinking about my own keywords. Specifically, the words that we would soon be familiar with in 2017. Words that might necessarily been in the media had Hillary won the election; words like, ‘alt-right, cuckold, steve bannon, putin, russia, neo-nazis’. I began thinking how to find these list of words that were not so prevalent in mainstream media. As I was leaving my house to go to the studio, I noticed that our paper boy had delivered the Sunday edition of The Los Angeles Times (which we subscribe to). It occurred to me that I only needed to gather the words from this one media source to get the discourse of current American politics. I bought a block of plasticine on my way to the studio, and in the studio I began impressing words that I can cut from the December 11th, 2016 edition of the Sunday Los Angeles Times. 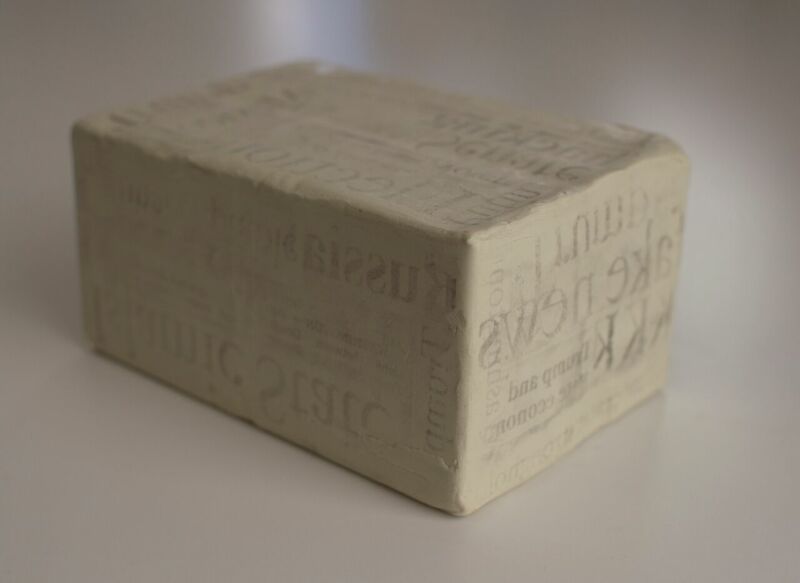 The medium of plasticine was able to remove the ink from the words, but could also be easily erased and re-impressed with more words. Andres “Bannon” painting was made right after the 2016 presidential election, which occurred just after I made the “Whiteout/Blowdown Forest”. In that piece, the term “whiteout” referred to a blizzard, and how during a whiteout, the landscape is lost. With Trumps appointment of Steve Bannon, the terms “Whiteout” and “Whitewash” started to merge in my mind as white suprematists and neo-nazis celebrated Trump’s victory and Bannon’s appointment as Chief White House Council. Bannon, as head of Breitbart News, oversaw the creation of fake news stories that catered to white suprematists. These stories were knowingly perpetuated by social media because removing them was likely to impact the bottom line, as alt-right (white suprematist) users are large in number. 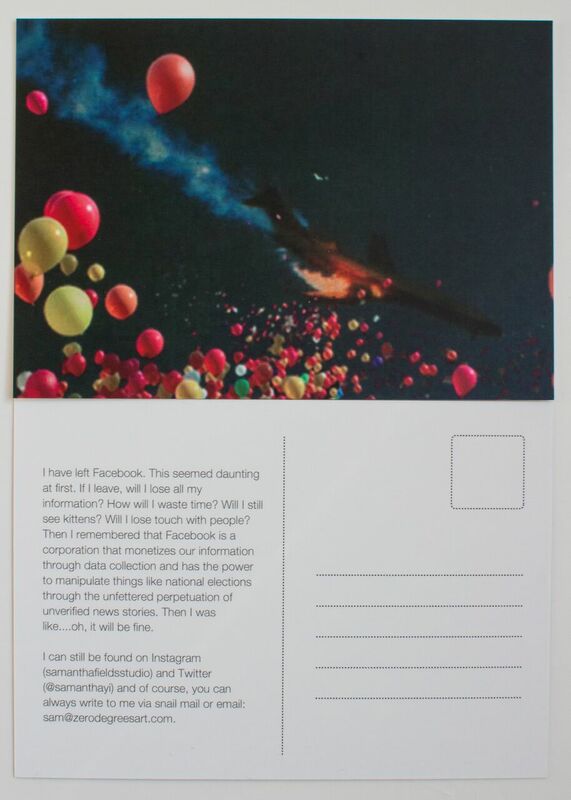 As a response to both Andres piece and the election in general, I deleted my facebook account as a personal protest, and created this postcard, which sent to over 200 friends to announce my departure and provide alternative contact information. Shortly before going to the studio, Donald Trump won the American election in a stunning victory over Hillary Clinton. Being a huge Clinton supporter, actively and financially, Samantha and Andre were devastated. Andre felt that Mr and Mrs Exquisite Corpse should no longer ignore what was so largely looming in the foreground of America’s psyche. 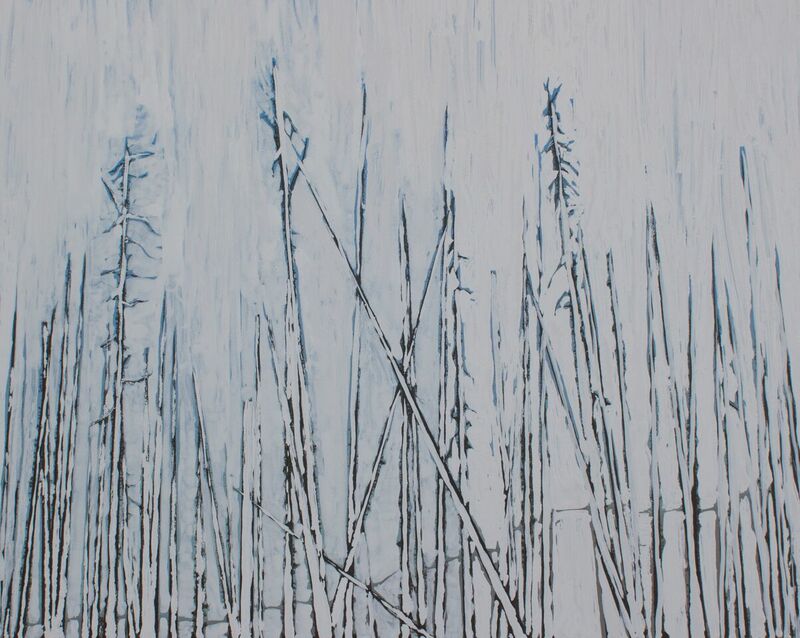 Looking at the painted forest that had been whited out and effectively erased, Andre saw this as a possible metaphor for the coming Trump administration. 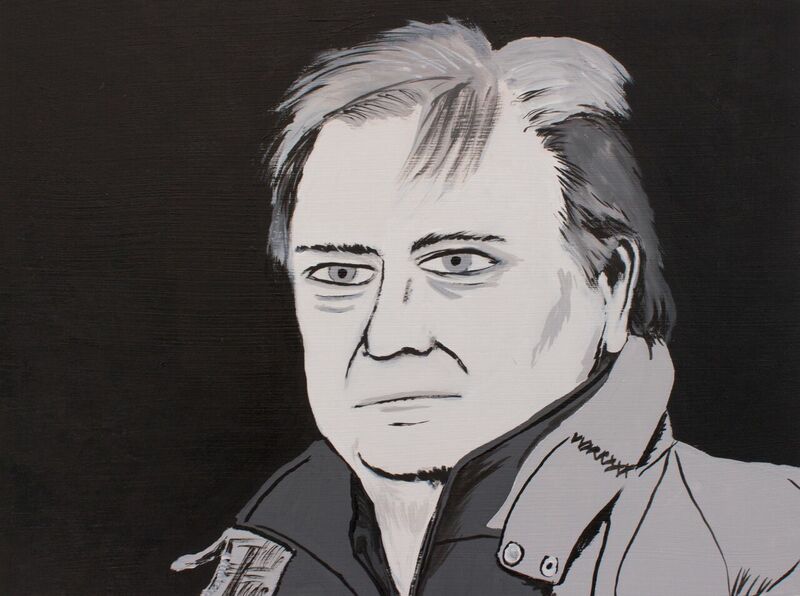 Andre painted a portrait of Steve Bannon in black and white, with Steve Bannon being the dominant white section in the portrait. Bannon, as the head of Breitbart, has been well known as bringing out the ‘Alt Right’, that fringe of conservatives seen as racists and bigots, to the polls for the 2016 election. 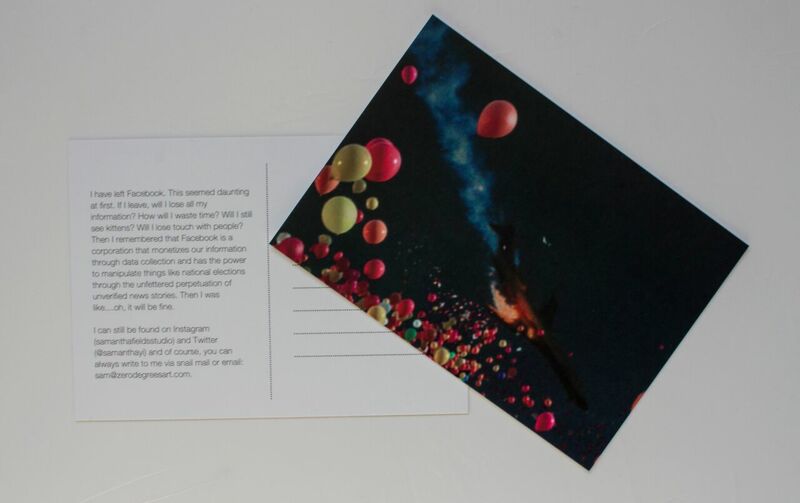 Samantha started with a photograph of the blowdown forest at Mt. Saint Helens, where she and Andre traveled several years ago. She painted the forest, and then responding to Andres installation, whited out the entire painting, leaving only small boundaries. The term “whiteout” refers to a blizzard so intense, that it reduces visibility to zero, effectively “erasing” the landscape. Andre had the top part of a noble fir Christmas Tree in his studio, which had been painted white. Looking from the top, the tree looked like the stars inverted from Samantha’s image. Andre began cutting the tree into sections and hung them on the wall. 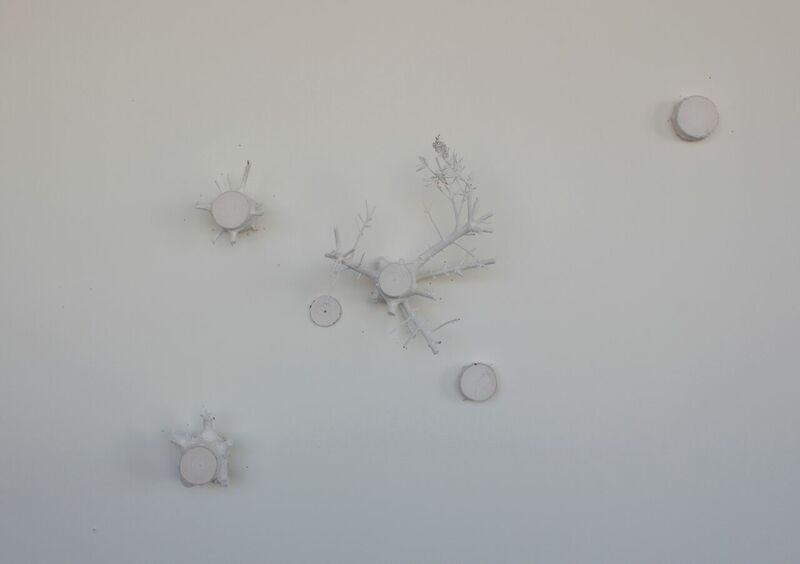 Because it took a couple of tries to composite the ‘tree cosmos’ correctly, the wall had several dozen holes of varying sizes that also mimicked the inverted cosmos that Samantha had created. Andre kept the holes without covering them since it contributed nicely to the ‘tree cosmos’. 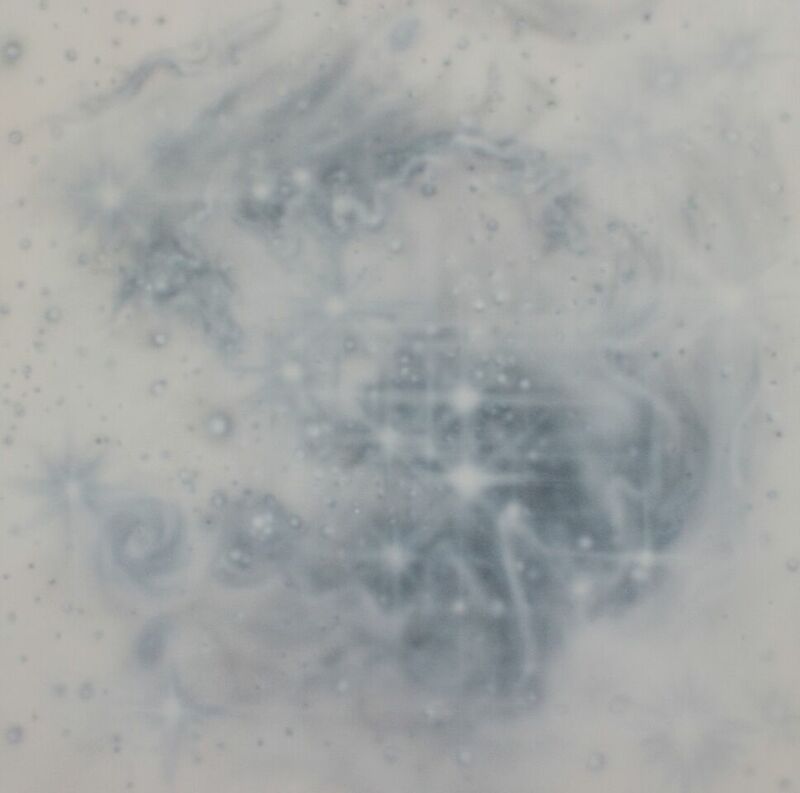 Samantha began with an image of a small magnetic cloud, shot by the Hubble Telescope. First, she converted the image to black and white in Photoshop, and then “turned it inside out” by reversing the black and white values. 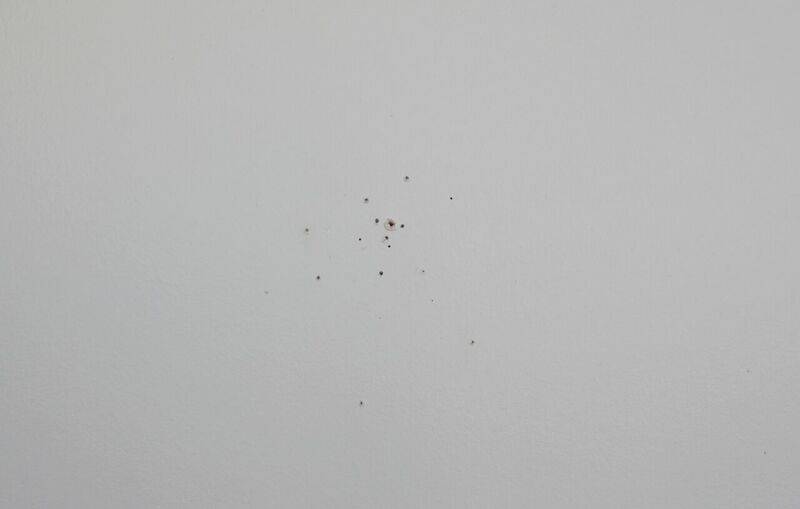 This made all the stars black, and all the space in between white. She then painted the image, and once it was complete, painted out all the stars. 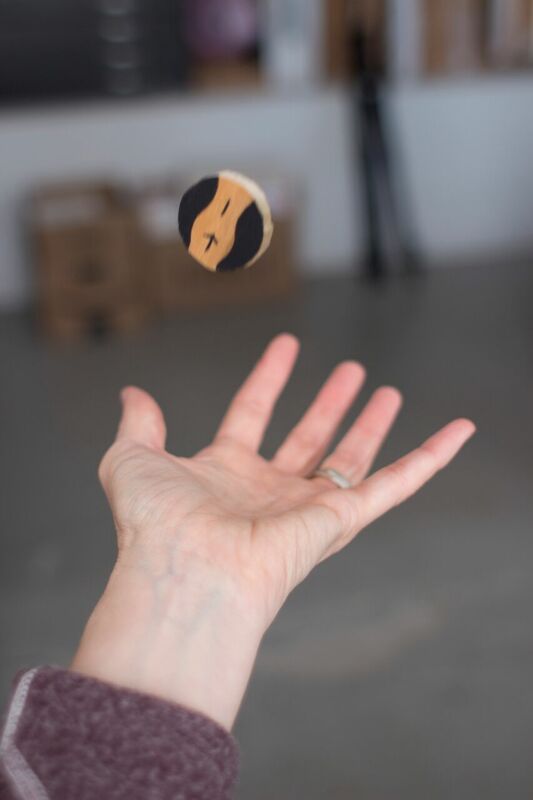 Samantha decided to toss the coin regardless, and photograph it. Coincidentally, Samantha won the coin toss. 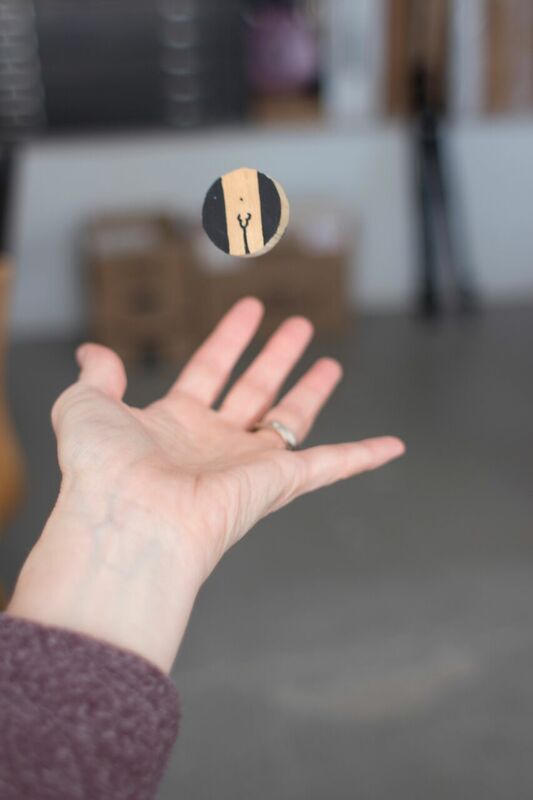 Andre began the collaboration by making a coin for us to toss. 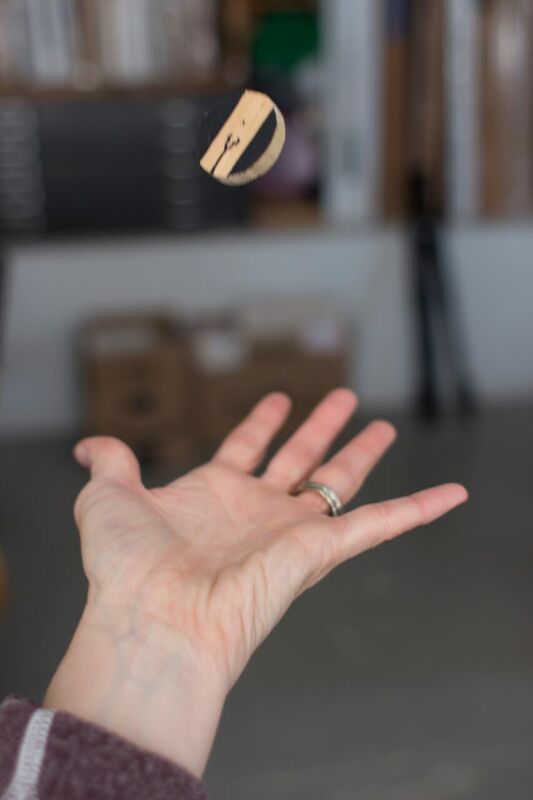 Ironically, he made a coin to toss to start the collaboration and in the process, made the first work himself.